Find target buyers; Engage and qualify prospects; Drive Market Qualified Leads (MQLs). We are a globally-recognized B2B lead generation agency. Our comprehensive methodology allows you to find and engage prospects across the entire customer journey. 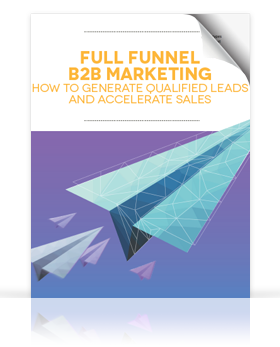 A successful B2B lead generation program requires a full-funnel, omni-channel approach including: PPC (Pay Per Click), SEO, social media, and content marketing. One of the most effective ways to engage prospects and improve conversion rate is via B2B lead generation landing pages and rapid, iterative landing page testing. Obtaining a lead is only the beginning. We import leads into your CRM and marketing automation systems and track leads as they move through the sales funnel. Integration with your CRM and marketing automation systems and a strong feed-back loop with sales allows us to improve lead quality over time and ultimately optimize your B2B digital marketing program based on (not volume of leads) but bottom line sales results. Contact us to work with a reputable B2B lead generation agency that can help increase quality website leads for your business.